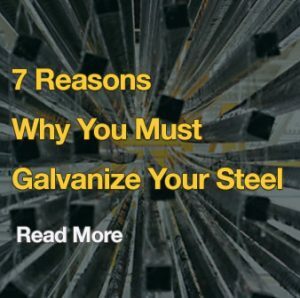 If steel fabrications distort during galvanizing, this is usually due to ‘built-in’ stresses being released, as the steel is heated to the galvanizing temperature. Stresses may be inherent in the steel, but they can also be introduced by welding, cold forming, and hole punching. 1. Controlling welding procedures during fabrication. 2. Arranging weld seams symmetrically. The size of weld seams should be kept to a minimum. 3. Avoiding large changes in structural cross-section, which may increase distortion and thermal stress in the galvanizing bath. Where there is an inherent tendency to distort, e.g. 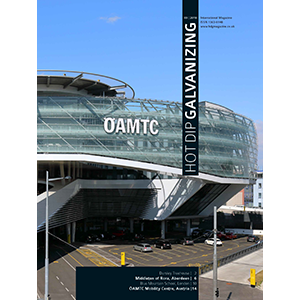 in asymmetrically shaped fabrications, the effect can be minimised or possibly eliminated by restricting the fabrication to such a size and design that it can be rapidly immersed in a single dip. The galvanizer should be consulted for advice at an early stage if this is being considered. The size and position of filling and drainage holes in fabricated vessels can have a major effect on distortion, as can the size and position of lifting holes or lugs, particularly on hollow fabrications.